It’s a weird choice for season six of Futurama to wind down (despite having one more episode next week) with a plotline it’s largely done before. Not just done and had largely forgotten, either; “Godfellas” was one of the strongest and most singular episodes of Futurama’s original run. A meditation on faith, causality and perspective, it featured Bender as a godlike figure who rules over a tiny species that develops on his body. “Godfellas” represented a point in the show’s evolution where it was willing to push its audience and try out concepts that really go beyond anything seen in animation before—or since. That being said, I’m guessing that wasn’t how “Overclockwise” actually began. Soon into the story, Bender becomes frustrated at his obsolescence and with some help from Cubert learns that there’s a simple solution to this: overclocking his processor. 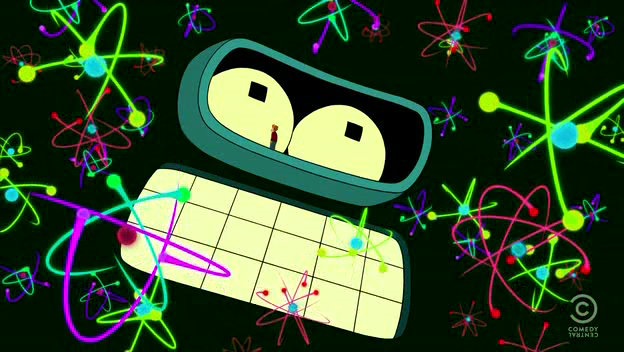 It turns out that not only does this radically speed him up, it leads Bender to realizing that he’s modular enough to simply add more processors and soon he becomes mind-blowingly intelligent. So intelligent that he can for all intents and purposes predict the future. This is an interesting concept. Having a character who can tell the future creates loads of odd questions for the rest of the cast to deal with, but unfortunately I feel like the show really got away from its creators here when they decided to continue stepping Bender’s overclocking up a few notches too many. Bender’s changes go against Mom’s end user license agreement for him and so she arrests Cubert and Professor Farnsworth. Meanwhile, Fry is rejected by Leela for some not-really-well-developed reason and is also out looking for his friend in order to find out what the future would have in store for them. So before the end of the episode Bender has once again become God, but this time for only a couple minutes of screen-time and without particularly interesting results. Unlike before there aren’t any real ethical quandaries considered, just a few visual gags and the universe as a whole is exactly the way it was before. The prophetic nature of an overclocked Bender was new, but this is completely subsumed by the myriad of subplots here such that this is the most unfocused episode in a while. “Overclockwise” isn’t without its charms, but in the same way that Bender’s transformation was a repetition, so was the romance between Fry and Leela. I’ve been largely waiting for Futurama to return to the pair and what developed during the movies (or the end of the TV show) but this was just so fast and slapdash that it didn’t really work for me. The pair reading the script for their future was sweet, but it didn’t feel as earned as something like “The Devil’s Hands Are Idle Playthings.” It also left me feeling that like every other development in their relationship, this one will soon be dropped by the wayside as soon as the next season begins. Not the finest ending for the season, but perhaps it’s fitting for one that has been consistently quite good but rarely gone beyond that. The show has really found its voice again, but a lot of the time it hasn’t known what to do with it. There’s something especially sad about a science-fiction show that can go anywhere and do anything repeating itself, and while I don’t feel like Futurama’s gone far over that edge, this episode certainly did more than just toeing the line. But I’m still anxious for more, even if it’s not with the same level of anticipation that I had for the show when it was first announced Comedy Central was commissioning new episodes. •I’m kind of happy that games in the future look significantly worse than ones made today. •The poster of Mom as Farrah Fawcett is pretty creepy. •”I really shouldn’t agree to things I don’t understand. But I’m slightly thirsty.” – I did appreciate the episode’s commentary on end user license agreements, which really are just completely awful. •”I can’t believe how stupid I used to be and you still are.” – This is basically the hipster motto. •Once more Nibbler is there. Are they doing this just to screw with me? How did he get back and why does no one besides me think this is remotely important? •The temporarily not going out of business sign is a nice touch. •The end may be forced, but there’s a truly great moment of comedy before Bender turns the script’s page.